Tradition and food go hand in hand. Wouldn’t you agree? It’s what many of us look forward to around the holidays. In our family, Christmas wouldn’t be Christmas without pasta and meat sauce for dinner. On Thanksgiving, there has to be turkey and all the trimmings! Who doesn’t have turkey at Thanksgiving?! You might as well dress Santa in black. But, did you know fish was part of the first Thanksgiving feast? Yes! Seafood! It makes sense, considering the event itself took place in the Plymouth Colony by the shoreline (I told you I was a history major in college, right?). While our typical Thanksgiving includes a turkey as the main event, I offer you an alternative for pescatarians (or just for fun) and for the sake of doing something different. It’s fantastic for non-traditional holiday entertaining, or perhaps, to serve alongside your tried and true favorites. My husband served baked fish in parchment one year, and it was quite memorable. 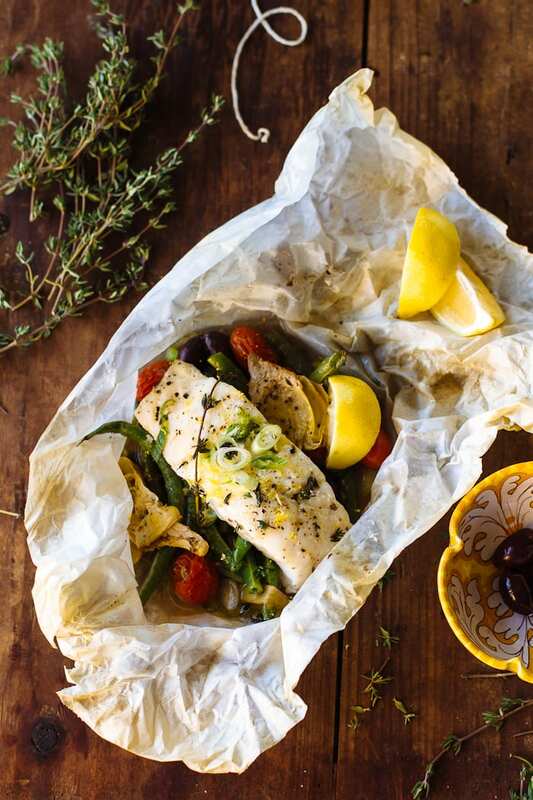 There are a variety of ways to make baked fish in parchment. It’s quick to prep, can be made in advance, and clean up is a breeze (just throw out the paper!). My version is Mediterranean inspired. 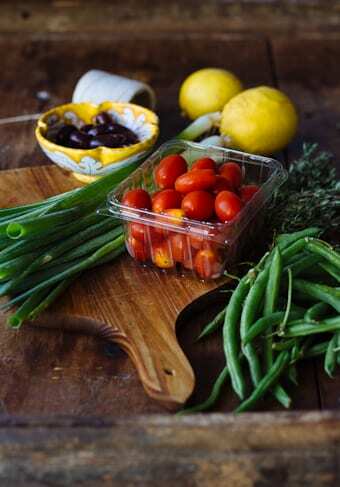 To assemble, stack the vegetables- I’m using thin green beans, tomatoes and olives- in the center of a piece of parchment paper. Top with cod fillets. Sprinkle with scallions, lemon zest and add a few marinated artichoke hearts. 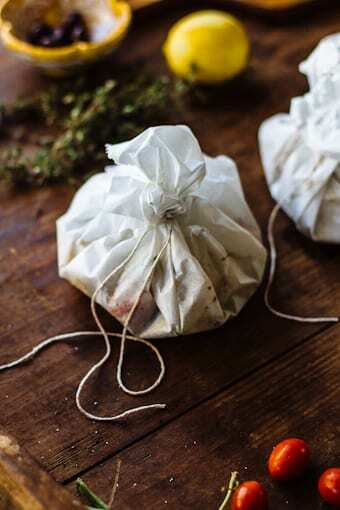 Twist up the parchment, and tie with kitchen string to create a bundle. 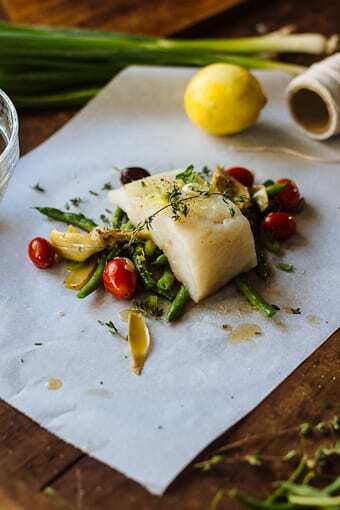 Bake for about 15 minutes; the cod and vegetables will gently steam inside of the parchment paper. A lovely ‘juice’ will puddle at the bottom of each bundle. 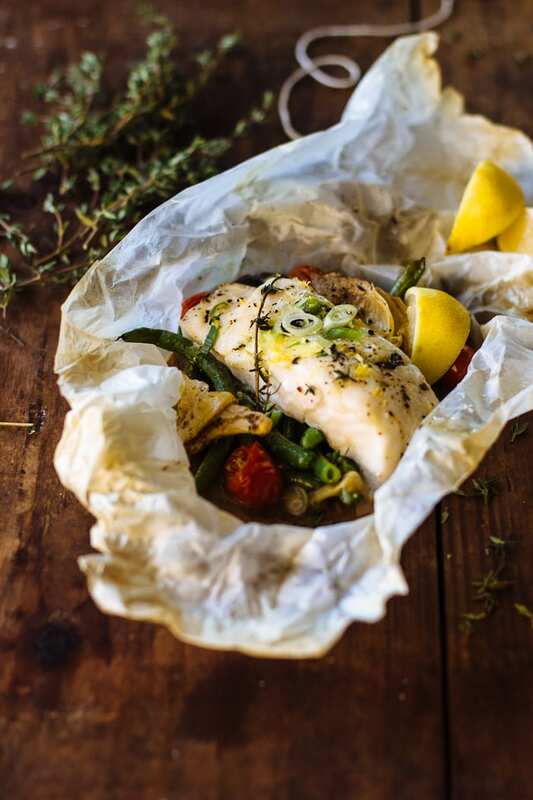 Serve the fish directly in the parchment, and have your guests open up the crinkly paper and experience the lemon-scented steam that willingly escapes the bag. I’m a stickler for quality when it comes to fish. I’ve served many wrecked dinners because my fish, not knowingly, contained chemicals. It tasted like mush. In conversation with my friend Jen, from Whole Foods Market, she suggested I check out their sustainable seafood for reputable quality and good deals. Whole Foods Market sustainable seafood program is very strict. Because they own and operate their processing facilities, they have the ability to closely monitor production and distribution for quality standards (yes really!). Additionally, they work with third party organizations like the Marine Stewardship Council (MSC) and Monterey Bay Aquarium to help restore our marine and coastal ecosystems and build a more sustainable seafood market. Whole Foods Market believes that sustainable seafood comes from responsibly managed fish farms and marine fisheries that maintain healthy fish populations and ecosystems. Farm raised fish are treated with care. No chemicals. No antibiotics. Not only that, I was able to score a great deal on cod. I bought MSC rated cod in frozen Club Packs. The idea behind Club Packs is to ‘buy big and save.’ My 2 lb bag cost under $18 (I’ve seen cod go for $16.99 a pound!). Each fillet comes individually wrapped for convenience. I like that. Whole Foods Market also has an amazing deal on homemade pies baked in house. You can purchase (3) 9-inch pies (apple, blueberry & cherry) for only $19.99! That’s an instant $15 savings off the regular price. 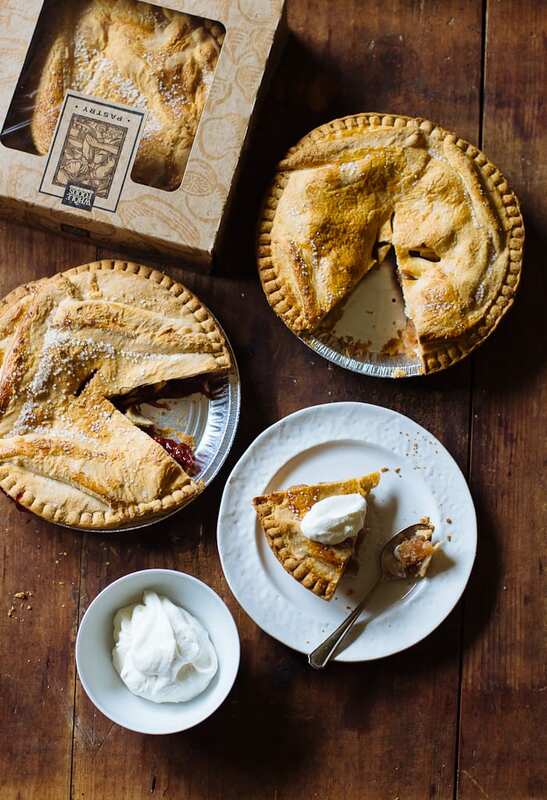 This pie offer is available in the Northeast region of The US, and runs until November 25 2016. Check out their Holiday Menu for more details. So tell me, what are you serving for the holidays this year? Traditional or non-traditional recipes… or both?! *This post was sponsored by the lovely people at Whole Foods Market. I’ve been a happy customer since 2000. All opinions are my own :) Recipe inspired by Food Network. *This recipe was tested with center cut cod, which is a thicker portion of the fish. If using a thinner cut (i.e. tail end of cod or even salmon) you might have to reduce cooking time. *Make sure to use thin green beans (haricots verts). Regular green beans will take longer to cook. Check out the deli section for self-serve olives and marinated artichoke hearts. Grab a rimmed sheet pan. Cut 4 pieces of parchment paper to the approximate length of the sheet pan. The size is important; you want to make sure it will fit all of the ingredients comfortably. Remove fish from its packaging and blot dry with a paper towel. Transfer to a plate. Drizzle lightly with olive oil and season with salt and pepper. Zest 1 lemon directly over the fish fillets (if your lemons are small, zest the remaining lemon). Strip the leaves off of 2 thyme springs. Sprinkle over the fish. Set aside. 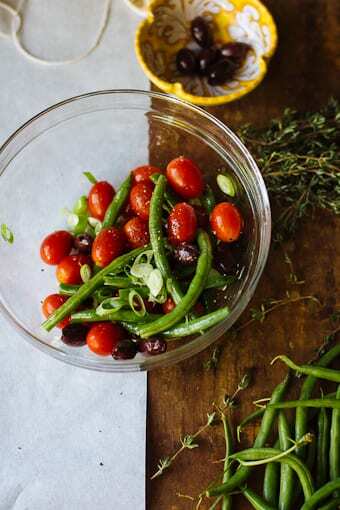 In a large bowl, add the green beans, tomatoes and olives. Add the olive oil. Season lightly with salt and pepper. Toss well to combine. To assemble, place a portion of the green bean, tomato and olive mixture in the center of each piece of parchment paper. Keep the ingredients stacked vs. spread out (it will be easier to tie up the bundles this way). Place your cod on top. Add 2 artichoke hearts. Add 2 sprigs of thyme. Sprinkle with some of the scallions. Repeat this process until you have assembled all of the cod. Gather the parchment paper on all sides and twist to close. Leave a little room for expansion as the fish steams. Tie with kitchen string to close. Place your parchment bundles onto your rimmed sheet pan. Bake for about 15 minutes (you can check a little bit earlier to see if the fish is done if you are unsure). The fish is ready when it’s firm yet flaky, and cooked all the way through. The green beans should be tender and the tomatoes soft. You can always open one of the bundles to double check. Cut the lemons you zested earlier into wedges for serving. To serve, portion the fish (still in is parchment bundle) onto plates. Have your guests open the bundles. Top each piece of fish with a small pat of butter. Serve with lemon wedges on the side. This looks easy and delicious; I can’t wait to try it! I really appreciate your simple and one pan meals. Fish parcels! What a delightful presentation and a fabulous idea for Thanksgiving Emilie. I love all the veggies and your delicious addition of lemon zest for brightness. I couldn’t agree more about sustainable seafood. We have to be aware of where our food comes from; from how it is raised/harvested to the impacts on the environment. MSC provides a handy pocket reference chart for this purpose. Overfishing, and fishing bycatch is an enormous problem, so thank you for discussing it here!! Our closest whole foods is about an hour and a half away, so when I go, I feel like a kid in a candy store! And those pies? OMGeee, Emilie! They look delicious! I’m tempted to skip the baking… and make the drive! Delicious work my dear! How can something this pretty be so easy?!! I’ve heard of this kind of cooking method for fish but have never dared to try! Thanks for the inspiration as always. Good to know whole foods aligns with sustainable fishing!! Ha! Thank you! We eat with our eyes ;) Definitely give this a try- it’s a fun (and healthy) way to enjoy fish. I’ve tried making parchment fish several times now, but for some reason, I always end up overcooking the fish! This dish looks wonderful, and I’m keen on trying it again. I had no idea that fish was served in the first Thanksgiving feast! Learn something new every day! Hi Lisa! If using center cut cod, about 1 1/4- 1 1/2 inches thick, it only needs about 15 minutes in the oven. Same with Salmon (of the same thickness).Feel free to untie one of the bags to double check a bit earlier perhaps at the 10 minute mark if you’re unsure (You can always tie it back up!). In the past, perhaps the fish you used was a bit thinner? This would definitely lead to overcooking. I mention this in the recipe notes, under the ingredients. Hope this helps! Whole Foods…ahhh. I don’t know what I’d do without them. I can almost taste the dish just by looking at the photos. Delicious! Right? My first experience with Whole Foods was back in college when I lived off their yogurt covered raisins from the bulk bin ;) You should try their pumpkin muffins right now… so good. What a great idea Emilie. Not to mention a super quick dinner ready in no time. I had no idea that fish was served in the first Thanksgiving. What a lovely traditional/non-traditional twist on the Thanksgiving dinner. Yes! Can you believe it? We’re so conditioned to think it’s only turkey and pumpkin pie. But I’ve read that shellfish, smoked fish, and even berry pies were enjoyed a the first Thanksgiving feast. How cool is that? And almost every picture you see of this iconic event, the shoreline is visible in the background. Food and tradition do go hand and hand, right? It makes the holidays and special occasions unique. I do hope you try this method, it’s quite fun! Thank you, Kathryn! This looks amazing! We do fish parcels with beans and a pesto crust. I love the addition of extra veggies here – and the great thing about parcels is non-smelly fish prep! Love it! Not sure I’m gonna swap out our turkey for fish this Thanksgiving BUT this recipe is going on my to-make list for another weekday meal. It would be really nice for a dinner party too because you could prep the packets ahead of time and then throw them in the oven at party time. I like the idea of twisting up the parchment with kitchen twine too. Never thought of that!